Are you one of those who fears on appearing for bank job interviews?There is a happy news for your people – No Interviews for Clerk posts in public sector banks hereafter.So candidates have to just qualify in the written exams to become a clerk or other sub-staff in any govt bank.This move is surely going to benefit all those who come from rural background creating an equal oppurtunity for them to compete. Few days before diwali, the Prime Minister Shri.Narendra Modi in his radio address to the nation proudly announced about abolishing interviews for low ranked jobs in govt sector.He also mentioned that it would be implemented from January 1, 2016. He had talked about Group B, C & D jobs that are normally filled through SSC recruitments.So it was not clear whether it applied to upcoming bank jobs that happen in PSBs. As the interviews are being scrapped, they have advised the banks to look for other alternatives in addition to the written exam scores. Are there interviews for PO (officer – scale I)? Yes.The letter talks only for clerical & sub-staff (peon,helper etc. 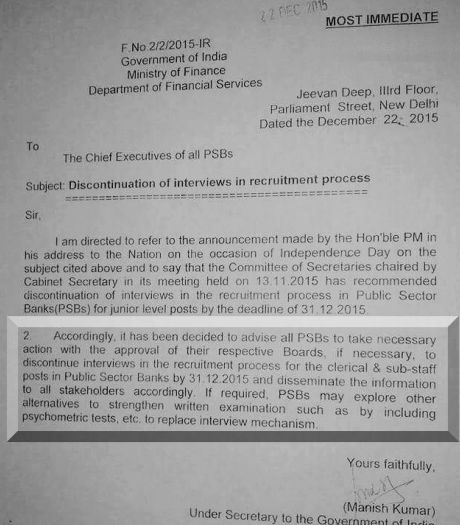 )Therefore candidates applying for bank PO recruitments will have to appear for Interviews. What about the IBPS clerk recruitment 2015 that is currently being held? As per the IBPS clerk notification issued in 2015, common interviews are to be conducted after the main exams. Since banks have not announced anything official about this, we may have to wait till the clerical main exam results are out. Written exams followed by Interviews were part of bank recruitments for long.Now with no personal interviews, there is a possibility for clerical prelims & mains to increase from next year onwards. Every year, approximately 30,000 clerk jobs are created in 20 govt banks for which 9 – 10 lakh register. Although there are two stages of exam currently, they may have to considerably increase the cutoffs to make sure required number of candidates are chosen for appointment. Psychometric Tests to be Introduced? In its list of alternative, the govt has suggested to include psychometric testing as a replacement for interviews. Psychometric tests are a method of testing a candidates`s potential using physcologically methods.It will have questions based on real life situations with 3 or 4 options to choose. The choices you make will be used to assess your capacity, behaviour, personality & other abilities.There is no right or wrong answer in these tests as whatever option you are choosing will tell about your mindset. It is already being used extensively in private sector like ICICI Bank for their hiring activites. But will it serve the purpose of improving transparency in bank jobs or create more confusion among candidates is the big question. Do you think eliminating interviews for clerk & substaff jobs in banks will be a benefit or not for candidates? Say it in comments.